This small, graceful Ptolemaic temple, completely surrounded by a brick wall, lies in a barren hollow and was dedicated to Hathor and Maat. It took shape under the Ptolemies. Within its precincts Christian monks built a monastery the remains of which can be seen to the left and right of the temple. It was these monks who gave it its name. Deir el Medina is often overlooked by visitors in favour of the larger, more impressive monuments. This is a pity as it is a temple of considerable beauty and in an excellent state of repair. It is thought to have originally been founded by the architectural genius under Amenhotep III, known as Amenhotep son of Hapu, who, like the architect Imhotep, builder of Zoser’s Step Pyramid, was deified in Ptolemaic times. In fact, there are two representations, of Imhotep and Amenhotep son of Hapu, on the pillars at the end of the screen wall separating the two parts of the building. The temple consists of a large vestibule (/) containing two elaborately adorned palm-columns with floral capitals and a screen wall dividing it from a central hall (2) and the back of the temple where there are three shrines. Here, as in so many temples in the Nile valley, the pure lines of Egyptian work and the elaborated Graeco-Egyptian style are found side by side. Passing through the entrance doorway of the temple we notice steep rocks. The facade, which has a hollow cornice, bears names which attest to the many Copts and Greeks who visited the temple. Facing us are the two palm columns and behind them the screen walls with pillars bearing heads of Hathor. Near the top of the wall on the left is a window which once lighted a staircase. 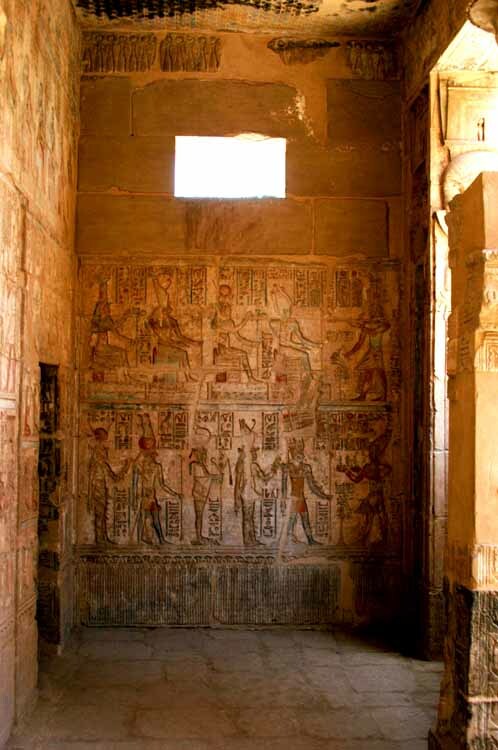 In the left-hand shrine on the left-hand wall (a) is a chapter from the Book of the Dead showing Osiris seated (near the end of the wall) and before him four genii of the dead upon a lotus flower. Thoth inscribes the verdict. To the left the heart of the decease (Philopator) is weighed by Anubis and Horus in one of the most complete representations of this scene to be found, and also one of the most beautiful. With the 42 judges of the dead (upper row) the deceased is led to the scene of the judgement by Maat who, in another representation and joined by Anubis and Horus, weighs the heart of the deceased against the feather of truth. Note that Anubis and Horus not only measure the weight but test the scales; Horus himself checks the balance; Thoth records the result. If it proves satisfactory then the deceased enters the underworld, if unsatisfactory he will be devoured by the hippopotamus-like monster before him. On the rear wall (b) the deceased offers incense to Osiris and Isis. On the right-hand wall (c) is the sacred boat with standards, etc. Above the doorway (d) is a four-headed ram representing the God of the Four Winds and above this strange creature a flying vulture worshipped by four goddesses. On the jambs of the doorway the Pharaoh is represented with three hawk-headed and three jackalheaded genii. In the centre shrine (j) are representations of the deceased before the various Theban deities. In the right-hand shrine on the right-hand wall (e) are fine carvings of seated deities: Osiris with Hathor, Isis, Horus, Nephthys and Anubis behind him. On the left-hand wall (d) are Mut, Amon-Ra, etc. South of the temple of Deir el Medina is the settlement of tomb and temple workers (page 70). The cemetery lies to the west.